Shutter Speed: The last post gave two of the three major adjustments that we have control over, at least to the mechanical and electronic limitations of our cameras and lenses. 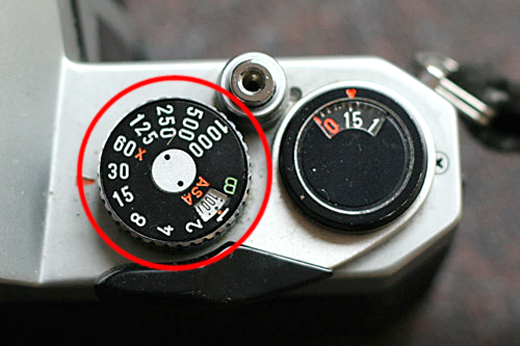 This typical shutter speed dial from a 35mm film camera clearly shows the shutter speeds expressed as whole numbers. Click here to read the original article. Light Theory: Let us assume that light can be quantified. The sun is radiating energy in specific units called photons. Without getting too technical, the photon is a measure of a fixed quantity of light. Think of it as a droplet of liquid energy, something like a raindrop of light energy. 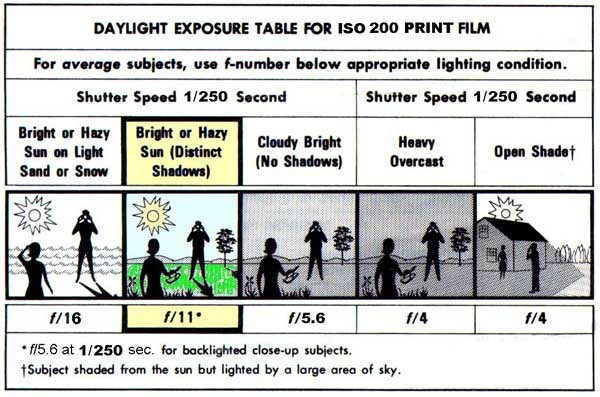 For now, this is all we need to know about light and the relationship to proper exposure. On a cloudless day than the photons pass through the atmosphere unencumbered. Our photographic subject reflects a "full value", which we'll address later. On an hazy day, many of the photons are reflected back towards the sun, their path blocked by interfering clouds. Depending on the density of the cloud cover, the light on our subject may be reduced by a factor of one-half to one-eighth, or even less. Exposure Length: Imaging that you have a photon source in the form of a faucet. Exposure length can then be likened to the length of time the photon "faucet" is opened. Taking it to the next level, we know how we can control the amount of this liquid light using the faucet, but how do we know when we have enough? ISO Redeux: Remember ISO? The last post merely stated the relationship to the values, which was purely mathematical. The higher the ISO value, the more sensitive the medium (film or camera CCD/CMOS sensor). In terms of liquid light, the higher the ISO, the more efficient the film/sensor. So far as the liquid analogy, the higher, more efficient ISO requires a smaller "bucket" to achieve that elusive "proper exposure". The Sunny Sixteen Rule: Enter the must fundamental exposure photographic truth: The Sunny Sixteen Rule. Here is a reproduction of the "instruction sheet" that accompanied every roll of film sold by Kodak for many, many years. In pre-war American, many casual photographers did not own light meters (built-in meters were many years in the future) followed these guidelines and achieved very close approximations of proper exposure, so long as they stayed outdoors and photographed well after sunrise and well before sunset. In short, you set you lens aperture to F 16, and set the shutter to the inverse of the film's ISO when photographing in Bright or Hazy Sunlight (see columns 1 and 2). Let's translate these recommendations into some actual values. This second row shows the necessary "exposure offset" (1 stop of additional exposure) necessary when photographing under a Cloudy Bright environment. This last row shows an exposure offset of 4 stops when photographing in open shade. Choose a large aperture (low numeric value) for less depth of field. Choose a small aperture (high numeric value) for more depth of field. Choose a fast shutter speed (short duration) when you need to stop action. Choose a slow shutter speed (long duration) if you want some blur. That's a lot to think about, since your built in meter already does nearly all of the heavy lifting. There will be exceptions, as we'll discuss in a later post.